everything LEB: What is it? I'm really liking the non-gender specific look of this room. Boy, girl, young, old- it could be for anyone. I like how the frames are propped up against the end of the bed, so casual and yet so done on purpose yet it works. I think that used to be the babies room, but now baby is grown up and gone so the lady of the house made a room to welcome any guy or doll. Nice mix of pieces, like the HUGE pillow and the smaller mirrors about the bed, the unique chandelier and flower arrangement with almost looks like a chicken. Are my eyes playing tricks on me? I really like the over-sized pillow with the fun trim. That floral arrangement really does look like a chicken? Wish I could bloe it up and look closer! Love the cozy buffalo check blanket! Nice image! The wall color is gorgeous. I think it looks like a college-age, slightly feminine guy :) I do really like it, though. I'm not seeing the chicken. Maybe it's like one of those optical illusion puzzles. You are so right. Could be a room for anyone. Just beautiful. Looks like the perfect guest room, I'm ready to move right in! I really like this gender-neutral look, too. Probably because my bedroom is that way, too. I thought I would miss the frills when I moved in with my husband, but I really don't. Turns out I prefer a cleaner, neutral look after all! I'm liking this a lot. Reminds me of a room tucked away in a sweet Scottish cottage. I love the mix of styles in this room...very cool. i like it too. it reads guest room to me. as in i'd like to stay in this room but so would my husband or brother. You are so right. This would make such a wonderful guest room!! I love black and white check anything! You're right. Just about anyone would be comfortable in that gorgeous room. I heart the wall color! LOVE! I would take this as my bedroom tomorrow! Look at cool that lamp is! Glad you found my blog last week...and I LOVE yours. 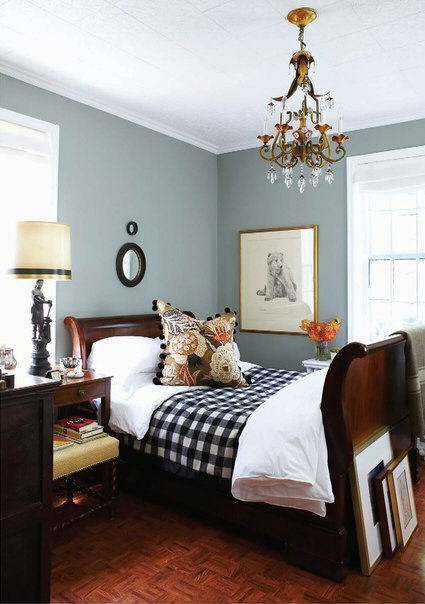 And this room is serving as major inspiration for my guest bedroom - great space!